In 2015 there were 186,830 children in 13 countries gathering over 2.2 Million Green Footprints, Grüne Meilen, Klimameilen, Groene Voetstappen, Miglia Verdi, Klimaschritte, etc. Please have a look at the menu bar on the left, where you find results, pictures and reports by country. 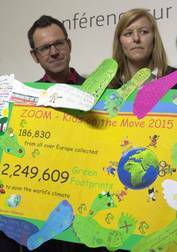 The ZOOM Report 2015 illustrates with many photographs and short reports in English and in the participating countries' languages what special actions the ZOOM-Kids all over Europe did this year to demonstrate their strong will to save our One World's Climate. 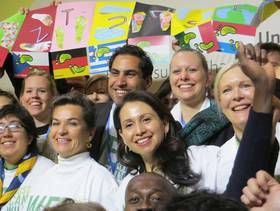 On Thursday 3 December 2015 Climate Alliance presented the climate protection efforts of almost 200,000 children spread over 13 countries to UNFCCC Executive Secretary Christiana Figueres and Ahmad Alhendawi, UN Secretary-General's Envoy on Youth. 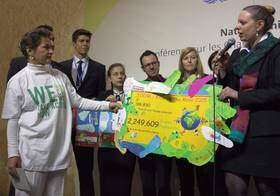 In 2015, children from Austria, Belarus, Belgium, Czech Republic, Germany, Greece, Hungary, Italy, Luxembourg, Netherlands, Romania, Sweden and Ukraine earned a total of 2,249,609 Green Footprints by making climate-friendly trips to school, saving energy in their classrooms, eating regional foods and choosing notebooks made with recycled paper. This year's handover of the children's footprints, wishes and demands for the future marked the official opening of the UN Climate Summit’s Young and Future Generations Day – designated by the UNFCCC as a "celebration of youth power and participation at UN climate change conferences." 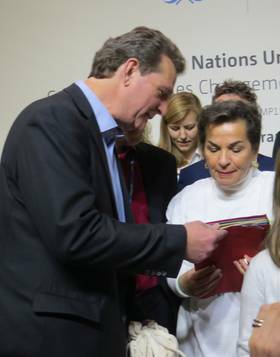 Carole Dieschbourg, Luxembourg’s Minister of Environment, in the company of UN Youth Delegates and local and national representatives of participating ZOOM countries, personally presented the Green Footprints along with the children's concrete wishes and demands to Ms Figueres. In doing so, Dieschbourg asked Executive Secretary Figueres to deliver these messages to the delegates of the conference. 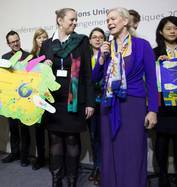 Especially prominent this year amongst the children’s demands was a sense of urgency in asking the UN Climate Conference delegates in Paris to finally pass a strong agreement. 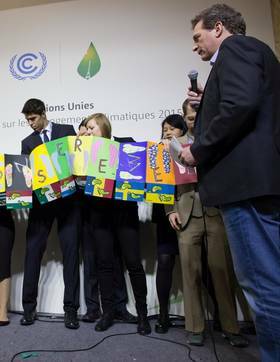 In addition to the Green Footprints, Thomas Brose, Executive Director of Climate Alliance brought a fan-folded banner made by a class in Cologne saying: "Schützt die Welt" (Protect the world). In order to underline that this demand is a main request of all ZOOM participants, no matter what country they're from, flags with the numbers of kids and Green Footprints by countries had been added to the banner. Along with the Green Footprints of 186,830 children in 1,300 European schools and daycare centres, came the children's 'wishprints' with clear pleas to the politicians in Paris. The 'wishprints' contained simple but clear statements like "I would like to have many healthy trees! ", "Polar bears cannot lose their sea ice!" or "Future? We are the future!”. Many children also asked for more pedestrian lights and bicycle lanes, for less garbage by packaging or for cheaper solar cells and electric cars. Carole Dieschbourg highlighted that the Green Footprints do not only reflect the great commitment of the participants, but especially represent that Europe’s children are giving the clear order to the politicians to finally sign an ambitious agreement which protects the future! That is why Thomas Brose finally presented a poster of a daycare centre in Neumünster, Germany, which expressed that strong demand of all ZOOM-Kids like this: "Dear Politicians, it’s in your hands! Please don’t destroy our beautiful earth!" Climate Alliance got assistance from many youth delegates as well as other representatives from eight out of thirteen ZOOM-countries, more than ever before - thanks a lot to all of them! 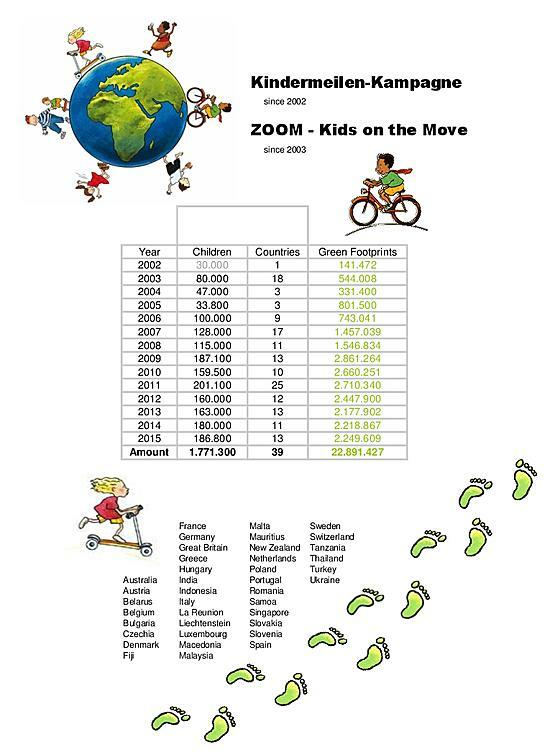 ZOOM-Kids are Moving for Climate Action since 2002 - you can imagine that they have collected quite some Green Footprints up to now. If you want to know how many exactly and from which countries they did come from then click here (pdf, 130 KB) or have a look at the picture below.